It is a gross violation of Occam's Razor to attribute the recent very broad-based run-up in dollar commodity prices primarily to the plethora of disparate causes to which they have been attributed: "peak oil", the war in Iraq, ethanol subsidies displacing food, and so on. Rises in industrial demand, increases in the costs of transporting commodities due to high oil prices, and so on explain only a small fraction of the rise in other commodity prices, and do not explain at all why precious metal prices have increased alongside those of other commodities. Occam's Razor points us, as it did to wise investors and economists in the 1970s, to the one kind of commodity all these other commodities have in common: the currencies they are priced in. In the 1980s, there were just as many of these disparate bullish factors for commodities as in the 1970s and as today. 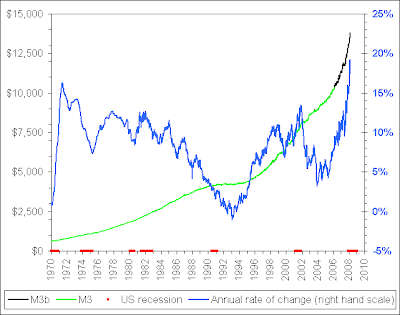 In the 1980s there was increasing industrial demand in Asia and the developing world, and the Iran/Iraq war drove insurance rates for oil tankers in the Persian Gulf into the stratosphere, yet commodity prices in dollars and dollar-linked currencies broadly fell, due to the emphasis of the Federal Reserve on fighting inflation throughout the 1980s. Commodity prices now reflect more the value of commodities as stores of value and hedges or media of exchange, i.e. their values as money substitutes or hedges, than they reflect demand for their industrial consumption. The trend lines for global industrial demand have not really changed that much -- the increases in Asia are largely offset by slower demand growth in Europe and the U.S., and at today's high prices we will see industrial demand slowly fall in the U.S. and Europe and level off in Asia. Obviously the euro also plays a big role, but it is important to observe that the euro too has inflated, just to a lesser degree than the dollar. The euro has not developed the track record that would make many international investors think euro-denominated debt does not need to be hedged with commodity derivatives. Some wise investors still remember the hyper-inflations and outright defaults of the late 1920s and early 1930s that made many government bonds almost worthless, the destruction in the value of the U.S. debt in the 1970s from inflation, and many similar episodes. In these circumstances commodities are usually safer than government debt denominated in the fiat currencies of the same governments that owe that debt. That's why the current flight to safety involves commodities as much or more than it involves government debt, and indeed the debts of less robust governments (ranging from municipalities in developed countries to the national debts of less developed countries) are no longer considered safe. It is well known by now that U.S. Treasuries are "safe deposit boxes" that pay negative real rates of interest -- i.e. one must pay for the privilege of storing one's wealth in a form backed by the vast future revenues of the IRS. They are a way losing one's wealth with less rapidity and volatility than with many alternative investments, not a way of actually building wealth. Commodities also store rather than build wealth. By contrast to Treasuries, commodities are more volatile, but are not subject to unknown future amounts of fiat currency inflation. A mix of U.S. Treasuries, European debt, and commodity derivatives now forms the ideal safe "store the cash under your bed" portfolio. Government debt alone is far too risky during periods when central banks are not strongly committed to reigning in money supplies. [The above is based on comments I made at the Marginal Revolution blog]. Imagine if the only place you could refill your gas tank was at home, so that you could never choose to drive farther than one tankful of gas would carry you. Furthermore, imagine that it usually required most of a tankful to get from one place you want to go to another -- or to get back home. So you usually could choose to go only one place per trip, and even when you could go more than one place, you had to plan the entire trip well ahead of time and could not deviate from it, no matter how much your needs changed while on the trip. That is largely the situation with space operations today. You have to plan the entire mission ahead of time. If in mid-mission you discover that you want to change the plane of your orbit, or extend the life of your satellite, or make any other change that requires more propellant than you long ago planned for, you are out of luck. If you want to reserve a wide variety of such decisions instead of committing to the entire plan up-front, it won't happen unless you launch a great deal of extra propellant that you will probably never use. Refueling capabilities and orbital propellant depots can change that. They provide choices -- what economists call real options. Like financial options, in an uncertain world real options often have substantial value. The kinds of real options commonly encountered in the business world include input mix options (options to use different inputs to deliver the substantially same output), output mix options (to use the same inputs to deliver different outputs), termination options (to abandon early failing projects or projects that have become unimportant), intensity or scale options (options to increase or decrease output), options to stop and restart, and switching options (the option to abandon one mean or end and change to another). All of these options can have a substantial operational and financial value that is not captured by traditional analysis of fixed plans. * Spy satellites have highly uncertain propellant usage, and often end their lifetimes mostly full of propellant or exhaust their propellant long before any other components have degraded. Propellant depots will give spy satellites real options to optimize time over certain targets, to avoid a variety of attacks by changing orbits, and add flexibility to respond to other unpredictable challenges. * Commercial satellites: depots will extend the lifetimes of satellites that prove to be important, and allow satellites to be relocated over new locations as markets change. (With a few extra features on a depot tanker, propellant already on board a broken satellite, or a satellite that has proved to be unimportant, might be "siphoned" back into the tanker and used on a working and important spacecraft). * Upper stages and satellites can be checked out to make sure they are in working order on orbit before being fueled. Immediate systems failure, which is a common failure mode, need no longer result in the waste of expensive propellant. This short list is probably the tip of the iceberg. Real options are about the unpredictable, and it's hard to make a list of the unpredictable ahead of time. On-orbit refueling and orbital propellant depots are not just a technology, they are part of a new paradigm. They are part of thinking of space activities in terms of real options instead of fixed plans. This paradigm recognizes uncertainties in space missions and businesses that traditonal fixed space planning has neglected. Making good use of propellant depots requires not only technology, but the recognition of these uncertainties, and as a result a recognition of the options that businessmen, militaries, and scientists would like to retain. Those options can then be brought to reality with refuelable satellites and orbital depots, quite possibly in association with other technologies that enhance mission flexibility in other ways. It's not propellant depots and refueling capabilities by themselves that will be beneficial, it will be their use to enable a wide variety of new and valuable real options for spacecraft operators and users. It will be a crucial and lucrative entrepreneurial task to identify these real options and enable them with refuelable satellites, depots, and probably a wide variety of other techniques and services. Going back to our humble earthbound example, real options explain why most commuters prefer cars (with gas stations available in a wide variety of locations) to mass transist. Mass transist resembles far more the fixed plan -- travel from home to work and back every day, and that's it. Under the fixed-plan assumption, mass transit is far less expensive and far more energy-efficient than automobiles. Cars, and the gas stations that refuel them, provide real options -- to pick up kids from baseball today, to go to a class after work tommorrow, to go shopping at one of a wide variety of stores, to visit your doctor or the emergency room when you get sick, to pick up your friend from the airport after work the next day, and so on. Mass transit and traditional space mission planning both represent the mentality of artificial certainty, the idea that we can simply plot out the future and it will come to fruition just so. At least space mission planners have the excuse of orbital mechanics, which is highly predictable. Human beings are not, nor are the vast variety of our needs and desires known to planners. Economic comparisons between mass transit and automobiles that don't account for the vast number and variety of options made real by the the latter will grossly underestimate the value of automobiles. Real options analysis also allows planning for discontinous risk, rather than the artificial assumption that risk is a continuous function that can be modeled simply by adding a risk premium to a risk-free interest rate. More on that, and the implications for space mission evaluation, here. Here is an introduction to mathematical analysis of real options, and here is a discussion of orbital depots for propellants that turn into vapors at normal temperatures, and are thus hard to store. No wonder, then, that this cycle’s bull market in commodity prices has gone higher in inflation-adjusted terms [i.e. in terms of the CPI and PPI -- a poor near-term measure of inflation, see below] and for longer than in all prior uninterrupted half-decade cycles in the past. I agree with Veneroso that the recent commodities boom has a strong causal link to the recent rise in the amount and variety of commodity derivatives. But I couldn't disagree with him more about the role of inflation. Prices, and especially wages, react very slowly to changes in money supply, so that the CPI and PPI are trailing indicators. The leading indicators are increases in money supply in excess to increased demand for money and the associated (if disproportionate) increases in commodity prices. Alice wants to promise Bob to transfer asset X. But the risks associated with Bob holding asset X on his balance sheet, or Alice holding liability X on her balance sheet, until actual transfer of the asset, are too high, or the transaction costs of actually transfering X from Alice to Bob are too high, or both. (1) Solution for risks of holding asset X on books: derivatives. Alice has both assets and liabilities on her books. These have individual and net risks just like an investment portfolio. If Alice has the same amount of assets and liabilities all denominated in the same currency, her portfolio is balanced. But if, for example, she imports from Europe (thus creating liabilities in euros) and sells in the U.S. (creating assets in dollars), her portfolio becomes strongly subject to risk of dollar devaluation against the euro. If a new asset or liability creates such unbalanced risk, it can be hedged with derivatives. (2) Solution for transaction cost of transferring asset X from Alice to Bob: use derivatives to create a synthetic asset. Construct from derivatives and asset Y a synthetic asset that economically behaves like asset X. These separate derivatives and asset Y that form the synthetic all can be transfered with low transaction costs, thus forming an asset economically equivalent to asset X but that, unlike X, can be transferred from Alice to Bob at low cost. The reason these uses of derivatives are seldom talked about is that the main cause of problem (1) is the instability of government currencies that it is legally necessary (for a variety of reasons) for contracts to be denominated in. The cause of problem (2) is usually a legal barrier to a particular transaction -- a tax, exchange control, risk caused by regulation, or risk of confiscation in Bob's jurisdiction are four examples. People who route around the law tend to do so quietly, explaining their acts by euphemism, even if as here the new route is perfectly legal and is made necessary by deep flaws in the law or the way the law is executed. There are often, in other words, huge discrepencies between the contract terms required or incentivized by law and the most economically efficient contract terms. Partly this is due to political stupidity, and partly to the inevitable profound imperfection of any body of rules. (3) A third function of derivatives is simply as a store of value: a way to diversify or hedge inflation risk in an investment portfolio that otherwise contains either (a) debt denominated in a potentially inflating currency, (b) equity in companies with assets consisting mainly of debts denominated in a potentially inflating currency, or (c) both. In performing functions (1) and (2), derivatives usually substitute for or augment currencies as a medium of exchange. For (3) they substitute for or augment the monetary function of a store of value. Most derivatives, in other words, perform largely monetary functions. They augment or substitute for a flawed method of payment or a flawed store of value. In a climate where one or more commonly used currencies are inflating (and by "inflation" I simply mean rise in money supply without concurrent rise in demand for that currency, not the CPI or any particular and usually trailing measure of inflation), derivatives, if they can be analyzed and traded at low cost, are very much in demand. Furthermore, if all of the currencies practically available for contractual payment terms are inflating, these derivatives will come to be increasingly based, not on currency-denominated debt, but on commodities, especially commodities for which supply and demand are relatively inelastic in the short and medium terms. 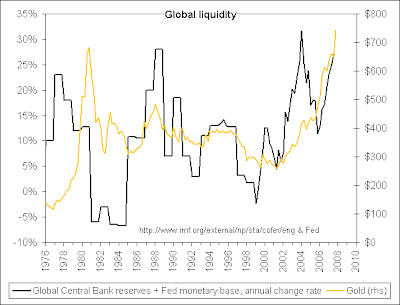 Why is it rational, rather than reflecting a bubble, for the recent rise in commodity prices to outpace the recent rise in money supply? The rise in commodity prices reflects the increase not just in supply of dollars per unit of commodity, but greatly increased demand for a commodity as money, i.e. for the monetary functions it serves either directly or indirectly via derivatives, on top of the relatively steady demand for consumption. As I have argued elsewhere, this increase is broad-based: all commodities that can be traded with low transaction costs on modern markets, and that exhibit short- and medium-term inelasticity of supply and consumption demand, are useful for and are being used as reserves for the new derivative currencies. Where computerized analysis lowers mental transaction costs, as with modern derivatives, it pays to diversify one's books, portfolios, and hedges among multiple currencies. Of course, the traditional use of commodities futures and derivatives by commodity producers and consumers to hedge the assets and liabilities of the commodity sales and purchases inherent in their business continues. But these don't account for the vast majority of commodity derivatives use in recent years. Before modern computers, networks, and software engineering, the cost of such derivatives was usually prohibitive. In the last period of monetary inflation and the resulting commodity boom, the 1970s, derivatives were available to few and only the very simplest hedges or synthetic assets could be understood, and even then very imperfectly. Today derivatives, and their use in very complex hedges and synthetic assets, are much better understood by most of their users, thanks to computerized game tree analysis, and are available to many. They can be designed, simulated, and traded electronically with very low transaction costs. Computerized derivatives are smart contracts that lower mental transaction costs. So much so, that they've created a vast new world of contractual relationships completely impossible with the brain alone. Speaking perhaps a bit metaphorically, we are witnessing the rise of new and privately issued fractional reserve currencies. They need not and effectively cannot legally be called "money" by their "issuers", nor can they effectively be used directly in most contracts for payments. But they can be used indirectly to hedge payment terms or investments denominated in flawed, that is in inflating or otherwise unstable, government currencies in which normal contracts and instruments are generally denominated. The results are synthetic "currencies" that, in their economic behavior, may be almost indistinguishable from a tradtional commodity-backed and privately issued fractional reserve currency. No wonder the Federal Reserve and other central banks are moving hard to usurp jurisdiction over derivatives (per, for example, the recently announced Paulsen plan here in the U.S. to consolidate a variety of financial regulation under the Federal Reserve). To effectively regulate derivatives, for better or worse, the Fed will have to understand them first. But they do not have this knowledge. Indeed no human brain holds this knowledge. The knowledge needed to understand the dizzying variety of derivatives exists mainly in the form of computer simulations. Derivatives, the money of the digital era, perform monetary functions in competition with the Federal Reserve's dollars, an increasingly primitive holdover of the paper era. By regulating derivatives the Federal Reserve regulates its competition. This creates a profound conflict of interest. It's like putting Rust Belt executives in charge of Silicon Valley. Such regulation may cause, not the popping of a commodity bubble, but the destruction of a nascent economic order made necessary by the prediliction of the Federal Reserve and other central banks to inflate their fiat currencies. Whether ignorance or conflict of interest will play the greater role in the destruction of the new currencies, or whether one will cancel the other out leaving the derivatives markets in relative freedom, remains to be seen. [Here's a prior explanation of mine giving a broader overview of why commodity prices reflect demand for their monetary functions as well as for their consumption, but not explaining the role of derivatives]. [*] These numbers are a bit stale -- it would be great to see to what extent this growth has continued. If any reader has data on commodity derivative use through 2007, please let me know. [UPDATE: here is more straightforward article that gets the basic facts right: production up, inventories up, consumption down, prices up -- inexplicable if consumption is the only major source of demand -- but gets the explanation wrong, replacing the rational and efficient use of commodity derivatives as money that I have described here with the typical speculations about "speculation" resulting in a "bubble"]. I am now publicly offering my consulting services. Besides topics I regularly blog about, my expertise includes technology product management (especially for e-commerce and wireless products and services), smart contracts, financial engineering, software architecture and engineering, and computer/network security. I can travel just about anywhere. Please contact me at nszabo AT law DOT gwu DOT edu for rates, availability, resume/CV, etc. Please describe or link to a description of your project and describe the services you need.